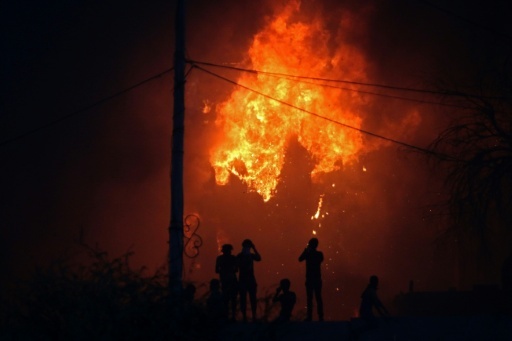 Basra (Iraq) (AFP) – Three mortar shells were fired into Baghdad’s green zone early Friday as a curfew was imposed in the southern Iraqi city of Basra after a fresh outbreak of violent protests over poor public services left one person dead and 35 injured. The rare assault by unidentified attackers on the heavily-fortified green zone, which houses Iraqi government officials and the US Embassy, came “without any victims or causing damage,” the head of security for the capital said. The attack comes as Iraq struggles with an outbreak of violent protests in oil-rich southern Basra, in which eight people have been killed since Tuesday as crowds have clashed with security forces and hurled Molotov cocktails at the regional government headquarters. Basra has been the epicentre of protests that have rocked Iraq since July, with anger fuelled by pollution of the water supply that left 30,000 people in hospital. AFP / Haidar MOHAMMED ALI. Iraqi protesters watch an official building in flames as they demonstrate against the government and the lack of basic services in Basra on September 6, 2018. “One person was killed and 35 were wounded; 24 civilians and 11 police officers,” said health ministry spokesman Seif al-Badr, without giving any more details. The statement came as authorities announced a new curfew in the city, where the local government headquarters and the offices of political organisations were in flames. AFP journalists also reported that the nearby governor’s residence was alight, while witnesses and sources said fires were raging at the local offices of several political organisations. 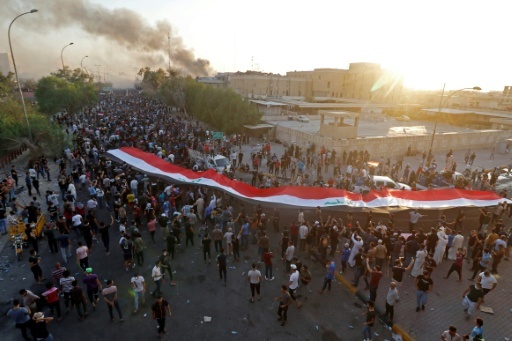 At least 23 people have been killed in the demonstrations since they erupted in Basra on July 8. Rights activists have accused the security forces of opening fire on the demonstrators, while the government has blamed provocateurs in the crowds and say troops have been ordered not to use live rounds. AFP / Haidar MOHAMMED ALI. Iraqi protesters wave their national flag in front of official buildings as they demonstrate against the government and the lack of basic services in Basra on September 6, 2018. “The people protest and the government doesn’t care, treats them as vandals,” said Ali Saad, a 25-year-old at the rally Thursday in Basra. “Nobody (here) is a vandal: the people are fed up, so yes they throw stones and burn tyres because nobody cares,” he told AFP near the building littered with debris. Ahmed Kazem, who was also at the protest, urged leaders to respond to the demands of the demonstrators “so that the situation doesn’t degenerate”. 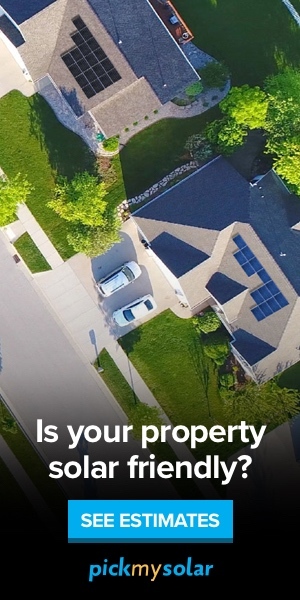 The 42-year-old said their demands included “public services, water, electricity and jobs”. Prime Minister Haider al-Abadi has scrambled to defuse the anger and authorities have pledged a multi-billion dollar emergency plan to revive infrastructure and services in southern Iraq. But Iraqis remain deeply sceptical as the country remains in a state of political limbo after elections in May. Shiite cleric Moqtada Sadr, whose political bloc won the largest number of seats, on Thursday called for a special parliamentary session to address protesters’ concerns. Politicians must present “radical and immediate” solutions at the meeting or step down if they fail to do so, he said. Abadi responded, saying he was “ready to attend a parliamentary session with the ministers and officials concerned, to discuss the situation and the needs of Basra province”. The premier is trying to hold onto his post in the future government through forming an alliance with Sadr, a former militia chief who has called for Iraq to have greater political independence from neighbouring Iran and the United States. Featured Photo: AFP / Haidar MOHAMMED ALI. 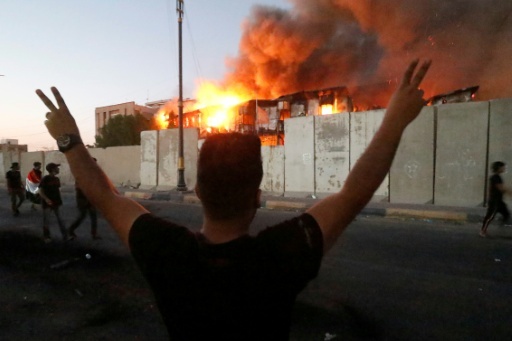 Iraqi protesters watch an official building in flames as they demonstrate against the government and the lack of basic services in Basra on September 6, 2018.